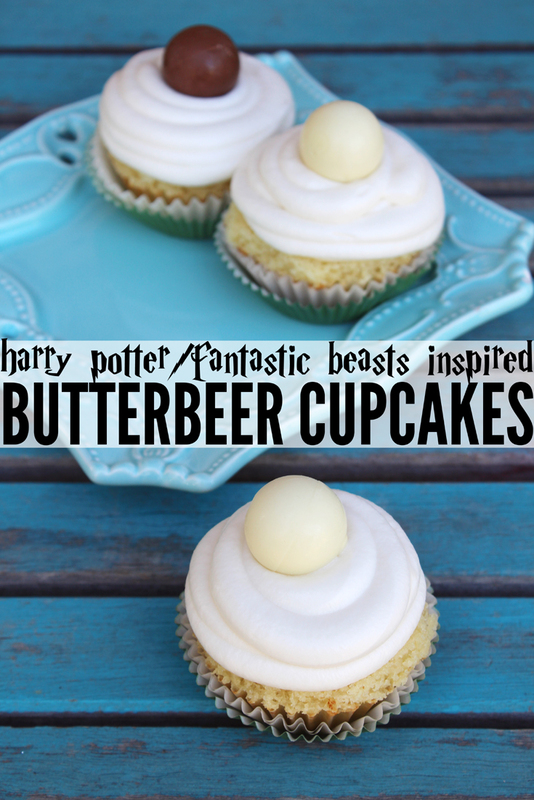 Doodlecraft: Fantastic Beasts: Butterbeer Cupcakes Recipe! Fantastic Beasts: Butterbeer Cupcakes Recipe! Butterbeer is such a great part of Harry Potter...have they even mentioned it in Fantastic Beasts? I don't know...but it doesn't stop me from making some Butterbeer cupcakes. These are sweet and buttery with an overload of butterbeer frosting too! Fill the liners with the batter and bake 350* for 18 minutes or until bounces back. Mine sunk a little, but it worked out just fine for the next step. Set them aside and let them cool down. While cooling, mix up the frosting. Pour the frosting into a plastic piping bag. I find it easier if I put the bag in a big glass and fold the plastic down over it. Then put one squeeze of butter rum syrup right in the top center of each cupcake...this is where the sinking cupcakes worked out perfectly! Then use the piping bag and add lots of butterbeer frosting on top! Top it off with a Lindt truffle or caramel syrup! Perfect treat for a Fantastic Beasts party!